Is It Possible to Make It in This Life? English boy: Is it possible for one to make it in this life? This one...? Is it possible that one falls down? Prabhupāda: It is possible in one second, provided you are serious. It is not difficult. Kṛṣṇa-bhakti... Bahūnāṁ janmanām ante jñānavān māṁ prapadyate (BG 7.19). "After many, many births, one..., when one is intelligent, wise, fully grown, wise, he surrenders unto Me," Kṛṣṇa says. So if I am intelligent, then I will see that "If that is the goal of life, that after many, many births one has to surrender to Kṛṣṇa, why not myself surrender immediately?" This is intelligence. If this is a fact, that one has to come to this point after cultivating knowledge for many, many births, then why not accept it immediately? Why shall I wait for many, many births if this is a fact? So that requires little intelligence. It does not require many, many births. It requires little intelligence. Take to this Kṛṣṇa consciousness seriously; your problems are solved. Now, if you don't believe in it, then come to argument, come to philosophy, come to reason. Go on arguing. There are volumes of books. You can be convinced. You can learn it. The every answer is there in the Bhagavad-gītā. You can try to understand it with your reason, with your argument. It is open. Just like Arjuna. Arjuna was taught Bhagavad-gītā, how much time? Utmost, within half an hour. Because he was very intelligent. This Bhagavad-gītā, the people of the world are reading. Very, very learned scholar, wise men, they are reading. They are trying to understand, giving different interpretation. And there are thousands of edition, commentary. But Arjuna was intelligent; he understood it within half an hour. So it requires of the relative intelligence. Everything... This world is relative. Law of relativity. That is scientific. Professor Einstein's theory? Law of relativity? So it is relatively. One can become immediately Kṛṣṇa conscious within a second, and one cannot become Kṛṣṇa consciousness after many, many births. So it is relative. If you have got sufficient intelligence, you can accept it immediately. If there is less intelligence, then it will take time. You cannot say that "It will be possible after so many years." That cannot be said. It is relative. Everything is relative. For a human being, from here to here, one step; and for a small microbe, it is ten miles from here to here. Ten miles for him. So everything is relative. This world is relative world. 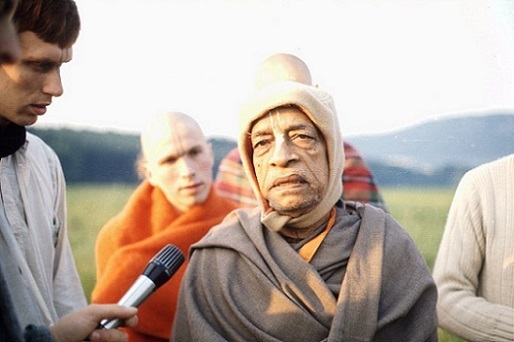 There is no such formula that "One can be Kṛṣṇa conscious after so many years." No. There is no such formula. One cannot become Kṛṣṇa conscious even millions after..., birth, and one can become within second Kṛṣṇa conscious. But on the average, within this life we can become perfect in Kṛṣṇa consciousness if we take it seriously. Especially you are all young boys. We expect at least you'll live for fifty years more. Oh, that is sufficient time. Sufficient. More than sufficient. More than sufficient. If for fifty years one chants simply Hare Kṛṣṇa, Hare Kṛṣṇa, he is sure to become perfect. There is no doubt about it. Simply if he chants this mantra, Hare Kṛṣṇa, oh, there is no doubt about it.